Recharge! Golf ~ Pool/Jacuzzi ~ Views ~ Bright, Beautiful Condo! A beautifully upgraded and tastefully furnished upper-end unit condo at gorgeous Mission Lakes Country Club! Wall-to-wall mirrors bring in natural light to the contemporary livingroom and are framed by mountain views from every window. Lounge on the chocolate leather couch (converts to full-sized bed) while you enjoy on-demand premium cable channels and high-speed internet. An entertainer's delight with a glass dining room table off the fully remodeled gourmet kitchen, graced with granite countertops, porcelain-white and glass display cabinets, and cool tile floors for warm desert days. In the master bedroom, sliding glass doors bring the outdoors in by opening out onto a small patio - the perfect viewing deck to unwind and take in your brilliant sunset views of the majestic San Jancinto Mountain range. My husband and I enjoy the condo as often as we can make the drive down from the San Francisco Bay Area. We loved Mission Lakes so much, we purchased a second unit in 2007. We are two professionals with a six-year old daughter - all of us enjoy swimming, hiking, dining, tennis and occasional golf in our desert oasis. We hope to welcome you to our home away from home. I have owned several condos in the Palm Springs area, but Desert Hot Springs is my favorite. It is just 10 short minutes from the hustle and bustle of downtown Palm Springs, but the high-desert (the area North of Palm Springs) offers moderate weather and gorgeous views of Coachella Valley -- especially from the Mission Lakes Clubhouse bar or restaurant and while playing golf on what golfers in the know call 'The Jewel of the Valley'. We love the warm desert air, views of the grassy greenbelt in front of the condo, swimming in the year-round heated pools and jacuzzis, golfing and enjoying the good food and gorgeous views from Mission Lakes Country Club's restaurant. We consider the condo our home-away-from-home and are happy to welcome you as our guests. Enjoy! Palm trees and mountain views from all windows in the condo...inspiring! Granite counters and stainless steel sink. The gourmet kitchen has been upgraded and is an inviting place for cooking and entertainment. iPod Stereo for your listening pleasure! The view from the back patio look west toward acres of open space, windmills and the San Jacinto Mountain range. The front patio looks across a large grassy greenbelt toward to the condo pool. Beautiful, mature trees are host to birds and provide a welcome canopy from the sunshine. Mission Lakes Country Club offers an award-winning Ted Robinson golf course with stunning valley views. Known as the 'Jewel of the Desert' by locals. I honestly can't go into detail of our accommodations. The only thing I can suggest is that you make sure that the pictures and descriptions on the website are as they say. We completely understand your comment as we own two units and there was an honest misunderstanding. We pride ourselves in providing a quality vacation experience in gorgeous Mission Lakes Country Club. Our guests typically rate us with four or five stars, so all I can say is we hope to host you again in the future so we can meet and exceed your expectations! Condo was just great. Everything that I needed, plus a nice hot tub/pool complex with laundry room. The owner was very cooperative as was the neighbor when I couldn't figure out how to get the key out of the lock box. A little far from the golf courses where I was playing, but easy access to the expressway. We enjoyed our stay at this condo in Desert Hot Springs. It was very convenient to all that we wanted to do and we did take advantage of the resort clubhouse and pool. The pool at the condo was very nice, as well. The condo was clean and very comfortable. We hope to return. We had a very enjoyable month-long holiday at this condo. Our host was very attentive to our needs, took care of everything we could have wished for. The unit was very clean and comfortable, and we made good use of the wifi and the free calling to Canada. The condo and clubhouse pools were very enjoyable, clean and inviting, and the people were warm and friendly. We are not golfers so did not play the course, but saw that it was a very popular attraction. Also, the meals at the clubhouse were great, as well as the rooms there that accommodated our visitors from home. All in all, it was everything we wanted and needed, I would not hesitate to return. Thank you again, Cristol! Condo was very comfortable and clean! We enjoyed the roomy king size bed which we are accustomed to at home. The kitchen was great and very well stocked. We appreciated the cable and internet access! The condo met our expections and for two people it is just right! The property around the condo was great and the pool was wonderful! We really enjoyed the option/access to the country club also. The golf course was beautiful and challenging and their pools were quite enjoyable. We met some friendly people at the condo and country club. We had very warm weather for April and the condo was very comfortable with great air conditioning. Downtown Palm Springs was an easy 15 minute drive. We visited the Joshua Tree National Park..not far and great for outdoor hiking. The owner worked well with us and was easy to contact and make arrangements. This condo was a great value and made our week visit very enjoyable... Thanks! We have just spent a month in this beautiful condo, and we could not have been happier with our choice. The owner went out of her way to provide us with accurate answers to our many questions, as it was our first trip to the desert. She also did everything possible to make our stay comfortable. The condo is nicely private and quiet, tastefully decorated and the views in all 3 directions are fabulous. It is also kept bright and very clean. Both the community hot tub and pool are exceptionally well maintained. The golf course is nice, but there are better choices available in the area at equally reasonable rates. 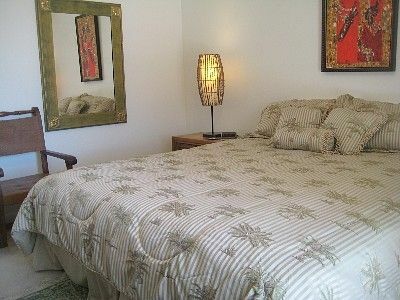 The location is very convenient for Palm Springs and all tourist attractions the desert offers. We would not hesitate to recommend this condo to anyone.